Spinal surgery accounts for more than 50% of neurosurgical practice and all neurosurgeons are well trained in this field. In addition, the Department of Neurosurgery is proud to have several faculty experts in the area of complex spinal instrumentation, including doctors Daniel Hoh and Christopher Fox. 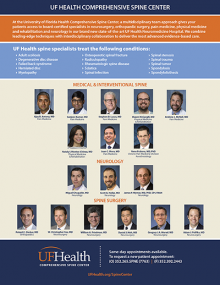 The UF Spine team performs virtually every type of spinal decompressive and reconstructive surgery. Disorders treated include cervical, thoracic, and lumbar disc disease, spinal tumors, spinal cord tumors, craniocervical junction anomalies, fractures, and a variety of degenerative spinal diseases. The UF team has helped to develop and perfect a variety of spinal techniques. Recent developments include minimally invasive spinal surgery (frequently performed on an outpatient basis), morphine pumps for benign pain, baclofen infusion pumps for spasticity, and computer guided spinal surgery. Over 1,000 spinal surgery cases are performed annually by our faculty. If you’ve had spine surgery, here is a guide to your postoperative care.